Our smallest boy is a petrol head. A tiny petrol head, but he’s the one in our family with the greatest love of cars. He has his own acquired collection of Disney cars from Walt Disney World in the shape of Stitch, Chip and Dale, Captain Hook and the like, but he’s always on the lookout for new and flashy numbers to build his fleet with. We’ve never had Hot Wheels in the house – I remember when I was little that my sister had colour change Hot Wheels, and that was over 30 years ago. One of Yotie’s best friends however loves them and so when this week we were sent two very impressive sets to review, we were pretty excited. They’d all been watching the adverts on the TV and getting excited about their arrival. The first set we opened – or rather, I opened as Gav was at work – looked terrifying. 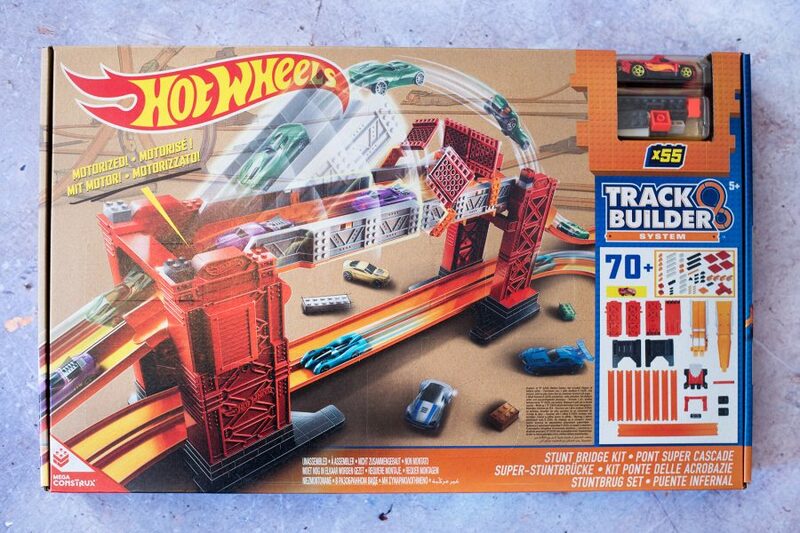 The Hot Wheels Track Builder Stunt Bridge Kit. So many tracks, all the same colour – and as we all know, I’m not the best at putting together anything that requires instructions. However, I only managed to get a few bits and pieces in the wrong places before it was assembled – and huge! 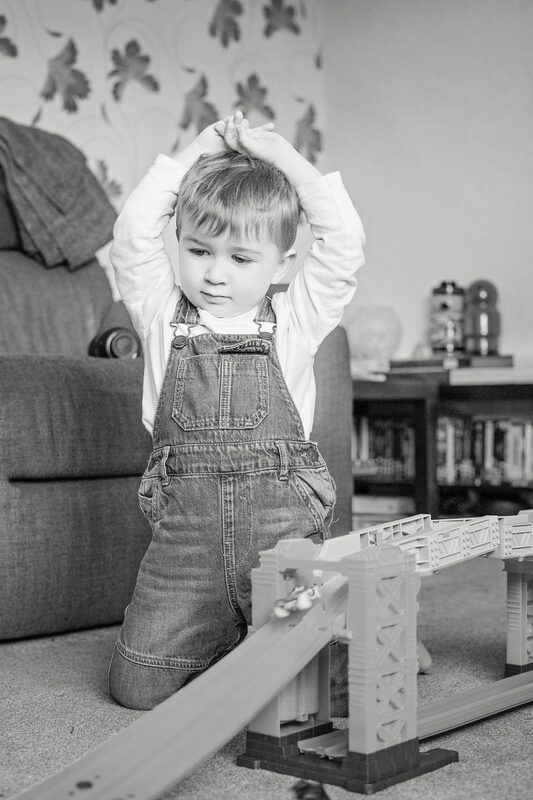 The set is aimed at children aged 4+ but Hero sat patiently by my side “brumbing” [as he calls it] his new little car around the sofa whilst I ummed and ahhed over what went where and finally when it was all put together, it looked amazing. I wasn’t sure how it was all going to work and then we realised that we needed batteries – and HUGE batteries at that, the D cell like batteries. This didn’t stop them playing with the set though until we got to the shop that evening – and from there onwards our living room was like a car missile launchpad as the boys tried to get their Hot Wheels across the bridge and down the other side in a Dukes of Hazard style manner. It was pretty epic, as Yotie would say. Thanks to the second set we’re reviewing, we have three cars and three boys – which meant no war and plenty of competition. 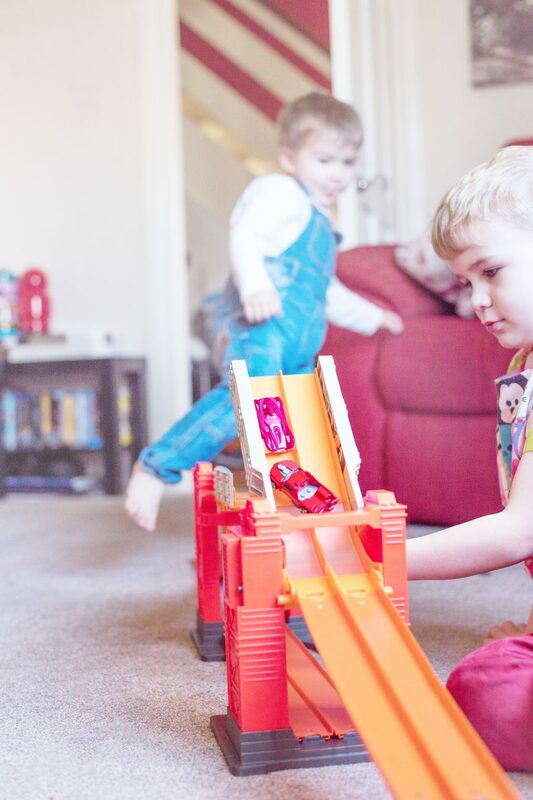 The Hot Wheels Track Builder Stunt Bridge Kit is extra special to the boys though. 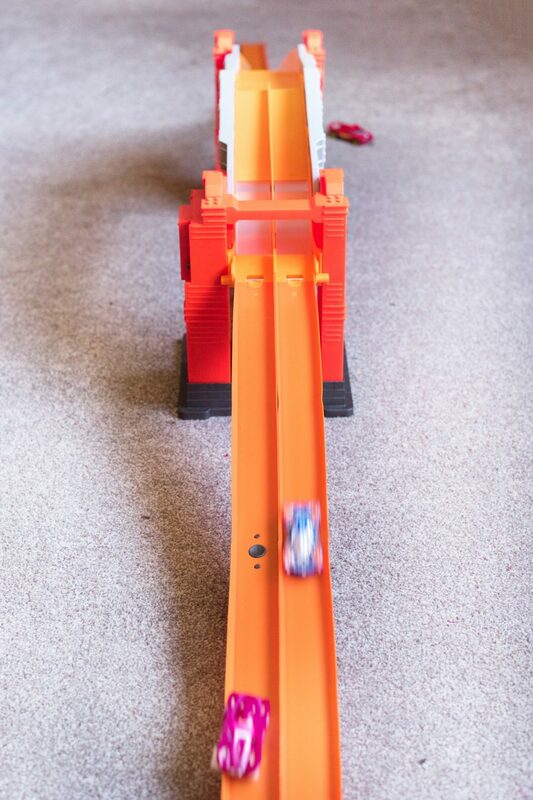 Not only does it have a motorised bridge which raises and lowers for the jumps, but also it’s brick compatible which means that a range of little lego like bricks contained in the kit can be used to create extra challenges for the Hot Wheels. We’re going to work on mastering the initial jump before we get all clever though, haha. …the flying cars! Of all the sets of cars we’re played with, this is the champion of launching cars. They fly through the air instead of reaching a peak and flopping to the floor. …the size. Bigger toys mean that all three of my boys can get around it and get involved instead of crowding each other out and arguing. …the motorised bridge. They estimate the best time for launching their Hot Wheels and it’s so much fun. …the challenges. Inside the instructions are details of three separate stunts which can be performed by using the building blocks [a bit like Lego] to create little extra parts to smash through. Jensen is about old enough to build these but they’re not possible for Yotie and Hero at 3 and 5 – too complicated. They’re all happy enough playing with just the bridge at the moment anyway. …that the launching didn’t need quite as much of a whack as it does to launch the car – Hero has quite a few failures to launch because his hand isn’t quite fast and hard enough to slam the pedal. I also failed quite a few times until I realised how to do it properly. …that the batteries were included – especially as they’re huge D batteries that we don’t normally have in the house. …the track could somehow fold up for storage. Taking it apart is pretty tricky and I worry about bending the track when I’m doing that, but it’s far too long to store anywhere whole, just like the Mickey Mouse set. …there were two cars in the set. I don’t understand as a parent why there’s just one. This means that if bought for someone who hasn’t already got some Hot Wheels cars, he or she can’t play with anyone – and there’s no racing to be done with just one car. 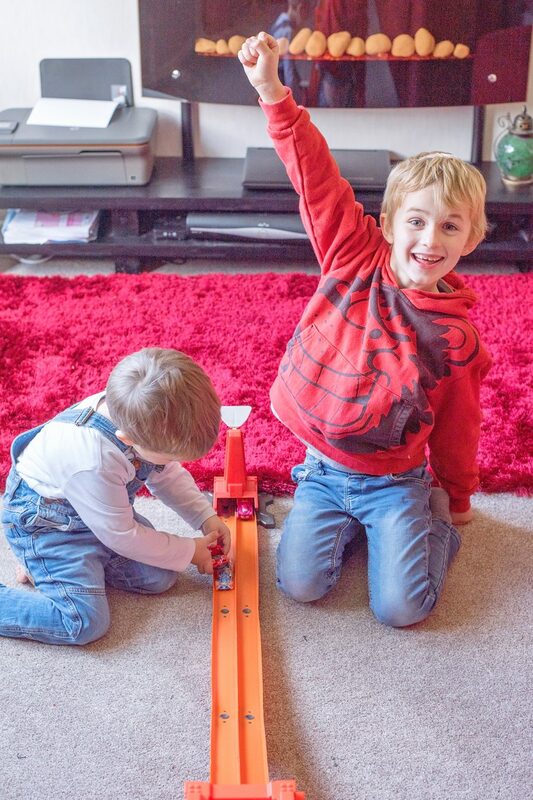 The Hot Wheels Track Builder Stunt Bridge Kit is available from toy stores for £49.99 – look out for our second review before Father Christmas makes his decision though!